Armenia’s capital and largest city is ancient Yerevan on the Hrazdan river. 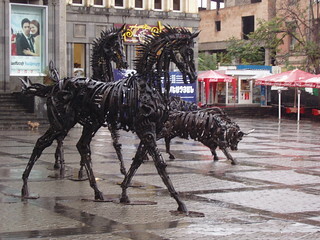 Yerevan is situated at the north-eastern end of the Ararat Valley and at the centre of the Armenian Highland. Yerevan’s location on a great plain, surrounded by mighty mountains on three sides, is stunning. It has been a continuously inhabited city since the fourth millennium BC, with Bronze Age settlements including Berdadzor, Shengavit, Tsitsernakaberd and its first known major historic period in the 8th century BC, when king Argishti built the formidable fortress of Erebuni. 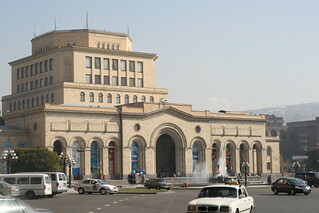 Today’s Yerevan is Armenia’s powerhouse, containing most of the local culture, art and industry, with the majority of national government administration as well. 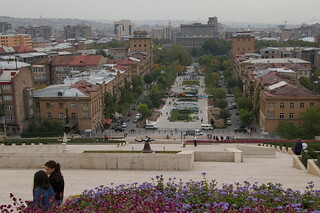 Yerevan was chosen as the UNESCO World Book Capital of 2012. However, Yerevan has a very sad story to tell, as it was the place of settlement for the survivors of the Armenian Genocide of 1915, when 1.5 million Armenians were killed by the Ottoman Turks. Post WWI Armenia was annexed by the Soviet Union and Yerevan grew into a much bigger city during this occupation. It has undergone an even more major transformation since the fall of the Soviet Union. The Armenian Genocide museum, the National Gallery of Armenia, the Matenadaran library, the Cafesjian Museum of Art, the Erebuni Museum near the fortress and the History Museum of Armenia are the first must-sees. Yerevan’s largest Armenian church (also in the world) is the Cathedral of Saint Gregory the Illuminator. You can also visit Erebuni Fortress. The impressive and modern Cascade complex, the historical site of Karmir Blur, the ruins of the Urartian city of Erebuni, the dancing fountains of the Republic Square and the State Opera House are also very worthwhile visiting. 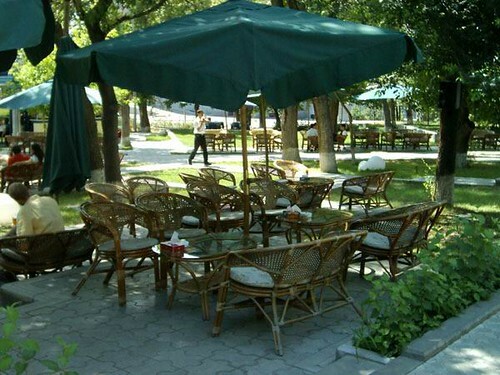 Opera Park has some lovely outdoor cafes for a relaxing stop during sightseeing. Yerevan’s Opera and Ballet Theatre offer unique artistic experiences in two concert halls (the Aram Khatchaturian and the Alexander Spendiarian National Theatre). The city’s famous Moskva cinema hosts the annual Golden Apricot International film festival.